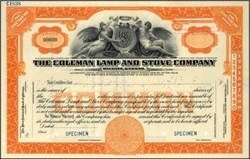 Beautifully engraved SPECIMEN certificate from the Coleman Lamp and Stove Company. This historic document was printed by the American Banknote Company around 1920 and has an ornate border around it with a vignette of the company logo between an angelic man and woman. Coleman Company, Inc. is a company that makes camping gear. It was founded by W. C. Coleman, who began selling lamps in 1900 in Kingfisher, Oklahoma and moved to Wichita, Kansas in 1902. The Coleman Company's headquarters are in Wichita, and it also has facilities in Texas. There are approximately 1500 employees. Throughout its history, Coleman has produced a wide variety of equipment primarily aimed at the camping and recreational markets. Perhaps their most famous product is the Coleman Lamp, a series of lamps that burn kerosene, naptha, gasoline, or propane and use one or two mantles to produce an intense white light. Coleman also manufactures camp stoves, hot tubs, and the like. In the past they also sold pop-up travel trailers and the Hobie Cat brand of sailboats.